Nothing can compare to the cost effective method of advertising online. When done right, cost per click advertising can drive targeted traffic to your website. With online advertising you only pay when someone clicks through to your website. Without the proper knowledge you can still end up paying a fortune and in the process, generate very few leads. That’s why you need someone to create a Google Adwords Campaign for you. We are a certified Google Adwords Partner. With Google Adwords, we’ll be able to target your desired buyer with sharp shooter like precision. When I first sought help from Jordan and Meaningful Marketing I was desperate because my business’ website had actually been blacklisted by Google. I was missing out on quality customers every single day. Jordan and his team carefully rebuilt my good standing and now I’m back to page one! It all started when I entrusted my company’s search results to ‘SEO Gears’, an outfit recommended by my website hosting company. After a few months I noticed that my customers started dropping off and that my listing had totally disappeared. I later learned that my site was being punished due to unscrupulous SEO practices and my business was suffering terribly. We were considering just dumping the site altogether and starting from scratch but Jordan went to work repairing the damage and I couldn’t be happier today. Coversation Before we begin,we’ll chat about your goals, who you want to target, what you’re advertising and what your budget is. Campaign Development From our conversation we’ll able to create a campaign that targets specific keywords within Google search results and on websites all around the world. If a website displays Adwords on their site as revenue source, we’ll be able to target their website visitors through geo-targeting. Most importantly we’ll create a budget that fits within your budget. Advertisement Copy We’ll create enticing copy which will attract only serious prospects and maximize your click through rates and money spent. Tracking All campaigns need tracking. 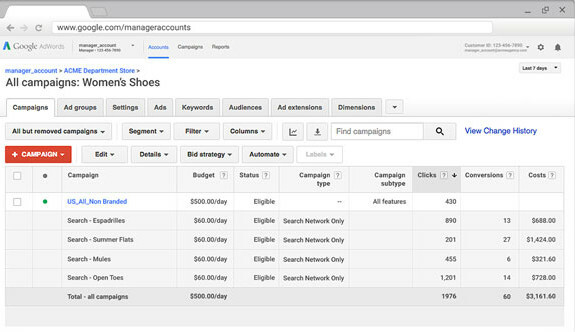 Thanks to Google Analytics we’ll be able to track the effectiveness of your campaign and make any adjustments. See our Google Adword blog posts for some quick help. Call us at 250-217-4176 or contact us below to see if investing in an Adwords campaign is right for your business.